Here is somemore of that lovely designer series paper. I paired it with very vanilla card stock, old olive ink and twine, and a little black punch arrow. The stamp set is one to add to your collection. 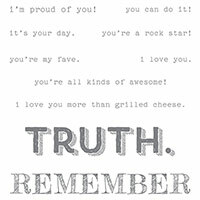 If for nothing but one stamp in the set...... "I love you more then grilled cheese". Is that too funny or what. Ya the inside of this card says that. It is going to be so fun to make a few of these and send to my kids and grand kids. I know they will get a laugh out of it. Words of Truth - perfect title for a very fun set. Comes in wood and clear.